As the second year of this pilot program approaches, the Faculty-Student Mentor Program (FSMP) thinks you would be a great addition to their team! Peer Mentors will be paired with a faculty mentor and up to 5 new students to lead crucial discussions and serve as a bridge to OSU for students in their first year. They are particularly interested in students who identify as first generation, low-income, underrepresented, transfer, or have experience in the University Exploratory Studies Program. Don’t know much about this program? Find out more information about the position on the website and in the position description. Trainings will be offered on April 30, May 1, and May 2 with official duties to last from Fall 2019 – Spring 2020. Apply online by April 30th. Questions and requests for accommodations may be sent to Gabrielle James at gabrielle.james@oregonstate.edu. Peace Corps recruiter, Scot Roskelley, invites forestry majors to come to a Peace Corps information session to learn more about how the Peace Corps works, the benefits of service (including money for grad school and enhanced hiring status for federal government jobs) and the timing for application (applicants typically apply about a year before they’re ready to depart). 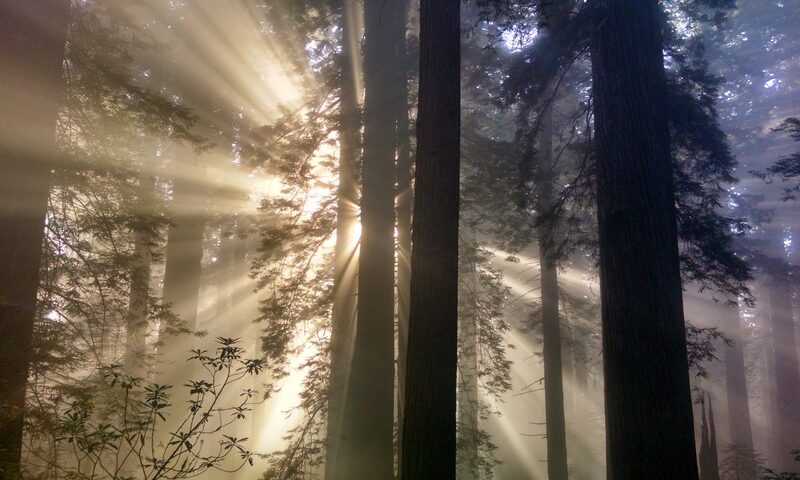 There are currently 38 openings in the Peace Corps for forestry volunteers. These openings are in Zambia and have a July 1 application deadline and depart Jan. 13, 2020. The title of the opening is “Ag. & Forestry Extension Agent.” More Peace Corps openings will be posted on May 1 and on Aug. 1 this year. Peace Corp Send Off Party– April 25, Strand 263, 6:00 pm – OSU students who are going into the Peace Corps will be there as will as faculty, staff, and community members who have already served in the Peace Corps. The alumni will talk about their Peace Corps experiences. The OSU students accepted into the Peace Corps will talk about why they decided to join and what they’re going to do. This is a perfect event to attend to talk to others who have served in the Peace Corps and get a sense of whether it’s something they might want to do. The Science and Math Investigative Learning Experiences (SMILE) Program is preparing for their Elementary/Middle School Challenge and College Connection event on Saturday, April 27. Our Elementary/Middle School Challenge brings together about 200 elementary and middle school students from all around Oregon to visit OSU. They are looking for OSU students to serve as volunteer mentors from 8:30 a.m. to 3 p.m. on Saturday, April 27 at OSU. They are looking for volunteer student mentors to answer questions about the college experience, share what motivated them to go to college, etc. No previous experience is needed. Please consider volunteering and share this opportunity with others whom you think would be interested. For more information or to volunteer, email smileprogram@oregonstate.edu or call 541-737-0534. The OSU Research Forests will be hosting the seventh annual Get Outdoors Day event on Saturday, June 8 at Peavy Arboretum. Get Outdoors Day is a bilingual, outdoor event that encourages youth to form personal connections with nature. They are currently searching for student volunteers to help make this event possible, as well as volunteers to provide Spanish interpretation to families. Volunteers will receive lunch and a t-shirt! Want to be a Forester? As you probably know, California has been on fire and much work needs to be done to help reduce years of fuel loading and to thin overly dense forests. By law, this work needs to be implemented utilizing Registered Professional Foresters (RPF) on private lands as well as for certain job duties on public lands. Graduates of your program will get substitutable education for a portion of the required 7 years of experience needed to qualify to take the RPF exam as follows; AS in forestry – substitute 2 years; BS in forestry – substitute 4 years; MF in forestry with a BA or BS in a forestry related degree; substitute up to 4 years; BS in forestry with an MF in forestry – substitute 5 years. Join instructor Yvette Gibson on a 2 week long Stewardship Tour around the 4 Corners. This is no ordinary drive around and look tour, students will interact with private, tribal, and public land managers; USDA research scientists; and non-profit organizations focused on conservation and regenerative agriculture. Applicant Interviews will be held in the Spring. Program listings provide detailed information about each project location, research activities, academic curriculum and credit, costs and instructor profiles. As concerned citizens we invite you to join one of our teams, and help in the effort to solve critical problems facing our wildlands and wildlife populations. Check out this Link to the Webpage for Program Info! Registration for OSU’s 2019 Celebrating Undergraduate Excellence (CUE) event is now open! CUE provides undergraduates with an excellent opportunity to showcase their research or creative activity. OSU undergraduates in all years of study, all academic disciplines, and all stages of research or creative work are eligible to present. Students can present solo or group projects. While most students present research posters, we invite students with artistic/creative projects and Ecampus students to apply as well. Please encourage students that you mentor/advise to present! The event will be held on Tuesday, May 14, 2019 9:00 AM to 12:00 PM, in the MU Ballroom. The deadline for registering for CUE is Friday, April 19th at 5:00 PM. Check out the CoF Student Clubs and Organizations! We have lots going on this month, and we hope to see you around! More information about each of the clubs can be found at http://studentservices.forestry.oregonstate.edu/sre/student-clubs-organizations. SNAP: Could you use help paying for food? The Textbook Lending Program offers eligible OSU students the opportunity to check out textbooks at no cost for the entire academic term! 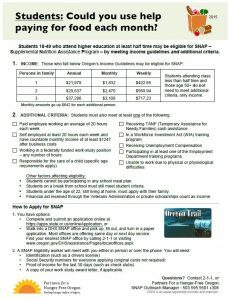 The program starts the first week of class and operates on a first come, first serve basis. They currently have books for 181 courses! Most of the textbooks are either donated or purchased. 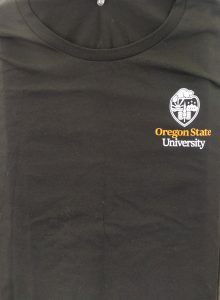 Students (and professors) can learn more about the program and check if we have their textbook by going to: http://studentlife.oregonstate.edu/hsrc/textbooks. 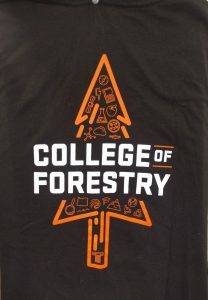 Interested in purchasing a College of Forestry t-shirt! Stop by Snell 133 or send an email to forestrystudentservices@oregonstate.edu if you are a distant student. T-shirts are $15. Shipping is $3.50.